Hasoffer, developed by Hasoffer Inc, is an which which rewards you for installing and playing Apps from the Google Play Store. Hasoffer will recommend popular mobile games from the Google Play store and you’ll earn credits by playing those games, and sharing your activity with friends. You’ll earn 130 credits from installing reward games and 300 credits translates into a $1 gift card. These gift cards can be used on Amazon in $1 and $2 quantities. Install Hasoffer App on your Android device and register with your email. Get the hottest mobile games recommendation and install from Google Play. 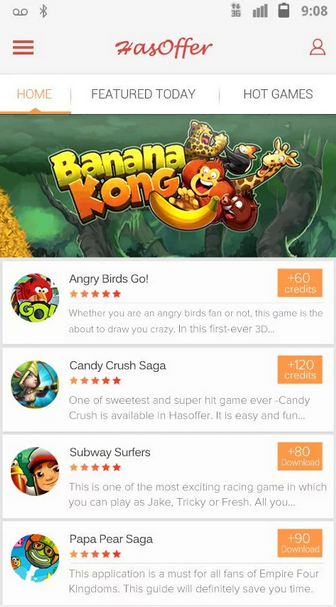 Get credits by free installing and playing the rewarding mobile games from Google Play. Unlock the beautiful wallpaper and play games to get credits. Redeem your credits into gift cards and in-kind rewards. Share Hasoffer with your friends via Facebook or Twitter and help them to get gift cards and in-kind rewards. Hasoffer is an excellent idea, but unfortunately the execution could do with some improvement. There were a few times where credits were not awarded despite installing a qualifying game. The user interface however, is extremely easy to use, and very simplistic, which makes Hasoffer a very pleasant App to use visually. Hasoffer is a great way to be rewarded for installing and playing Google Play Store games, and is free in the Google Play Store.